Stop the unconstitutional gas tax hike! Thanks to your phone calls and emails, the pro-tax hike politicians in Atlanta have started to feel the heat. As a result, they put their plans to vote on the gas tax hike bill, H.B. 170, on hold. But our fight isn’t over yet — they’re coming back to the Capitol today, and they could vote on the gas tax hike bill at any time. And I am afraid many of the politicians are going to cave to pressure from special interests and vote for a tax hike if we don’t make our voices heard. You see, the gas tax hike bill’s chief sponsor, Representative Jay Roberts, has been twisting arms and cutting deals to get his bill passed. At the hearing last Thursday, Rep. Roberts even admitted that parts of H.B. 170 were unconstitutional! Those sections of the bill were added to appeal to Democratic committee members. That just shows how desperate he is to pass this gas tax hike and to what lengths he will go to buy votes from other state representatives. Please take a moment to send another round of emails to the transportation committee members. I am appalled that your committee would even consider H.B. 170 after it was admitted by Rep. Roberts that parts of the bill are unconstitutional. Not only is H.B. 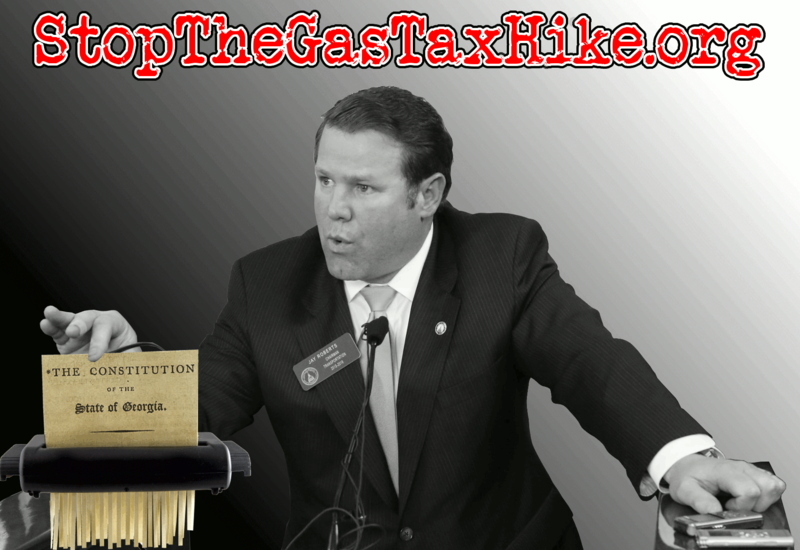 170 a massive tax hike that Georgia families cannot afford, but it represents a dangerous kind of lawlessness that I will not stand for. These politicians have started to feel the heat. Now let’s make them see the light! This entry was posted in Republican Party, Taxes by taxpayer. Bookmark the permalink.